The CW’s Arrow turned out to be a seminal series for the network, producing the spinoff The Flash, as well as the upcoming untitled hybrid team-up series. However, it seems that the show continues to find itself dancing around the apparently greater forces over at Warner Bros. studios, as it readies its unconnected DC Comics Cinematic Universe. Now, it appears that a major villain in the TV vehicle may have found himself a poetically “targeted” casualty of the pop-culture parallels of the upcoming movies. First, thanks for the kind words. I agree with you, our casting people — in Los Angeles and Vancouver — are the best. Unfortunately, Deadshot is off the table for the nonce. As most of you know by now, Will Smith will be portraying the role of Deadshot in next year’s mega-movie supervillain team-up Suicide Squad. Seeing as the casting of one of Hollywood’s biggest stars for the same role is likely to cause a bit of brand confusion amongst the populace, it certainly does seem like there will be room for only one Deadshot in the live-action ether. Unfortunately for Michael Rowe, that star-powered tug-of-war with Will Smith would not even be a contest. Much like a pro-wrestling match, the winner was predetermined before both competitors even stepped through the curtains. 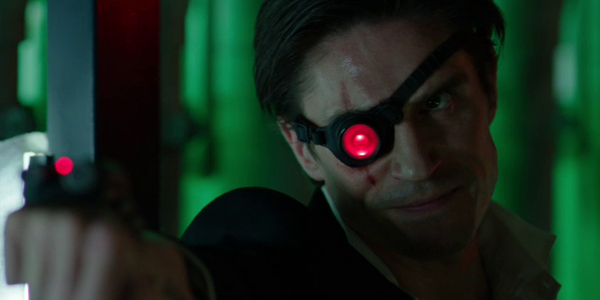 Consequently, the idea of Deadshot being “off the table” on the TV show is news that’s especially inauspicious, considering the way things went down the last time we saw the character in the Arrow episode “Suicidal Tendencies,” when it was implied that he was killed in an explosion. In fact, the episode in question was conspicuously centered on the up-until-now villainous Deadshot character, beginning what was clearly an arc of redemption. Our TV version of Floyd Lawton would be revealed as a military veteran, once a loving husband, who was transformed by the cold, calculating nature of his wetwork, descending into a tragic PTSD-caused psychosis that alienated him from everything he ever loved. Thus, his eventual turn as the heartless eyepiece-rocking paid assassin that we first knew was suddenly seen in a more sympathetic light. Moreover, his portrayal in the present working alongside his former mortal enemy John Diggle seemed to imply that he was turning an honorable new leaf. In his apparent last act of staying behind in a building rigged to explode to cover the rest of his brigade as they made their escape, Deadshot would certainly go out a hero on the TV show. Well, the latest news seems to nix any speculation that the newly-codified good guy might have survived the explosion, eventually making a return with a benevolent new agenda. Apparently we have the star of After Earth to thank for that unfortunate end. However, Guggenheim did leave a sliver of hope in his post by specifying that Deadshot was off the table over at Arrow “for the nonce,” meaning for the present. Perhaps after a time period when Suicide Squad has run its promotional course on the way to its August 5, 2016 release, then his critical qualification could become the Horcrux used to resurrect Michael Rowe’s rendition of Deadshot. After all, the show did introduce the Lazarus Pit to the continuity.